indeed preparing to present herself soon. Actually this Saturday will be the first day of Spring . always leave most of the honey in the hive for the honey bees and take only the surplus. This means there are lots of protein and carbs in the hives for the bees if they can get to it without freezing. 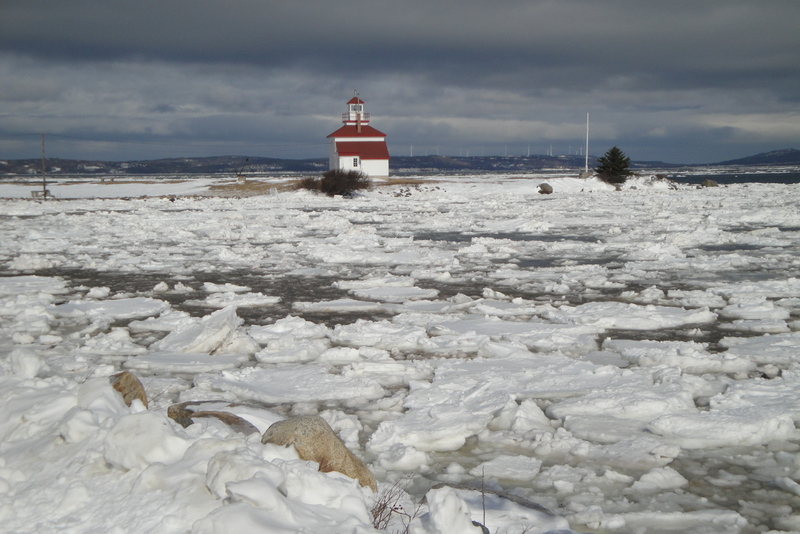 But the prolonged winds daily hitting against the hives, coupled with the freezing temperatures, has never been as bad as this year. What this means is that, even if there are emergency circumstances where we help our bees by putting in foundation, they will have no contaminated wax in their homes. Remembering that when things are normal in the hives the bees are drawing out their own comb and we encourage this practice because nothing can replace the subtle creative cells that the bees themselves create. The wax smells exceptionally wonderful because there is floral and vanilla scented propolis in the wax. Imagine the best aromatherapy session ever and you have an idea of what the bees in their home are enjoying. Considering that propollis is one of nature’s strongest antibiotics we can assume that the hives will be very healthy because of the aroma from this wax foundation. Workshops based on Biodynamic Principles on June l7 & 18 and June 20 & 21. Lots of registrations have already taken place and the increasing interest in Natural Beekeeping based on biodynamic principles is a huge movement globally. Part of being a good Keeper of Bees requires that you are always doing your own observations in the Bee Season and research and reflection in the Off Season. Nothing in nature is “instant soup” — it requires you to be totally Implicated with the Hive and its environment. This is the ethical way to relate to any other living species that you are involved with, and the bees are no exception to this rule. We recently joined IBRA (International Bee Research Association) based in the UK and all of their past magazines since 1919 to the present day are now available to us to read. This is truly an enriching experience. We ordered our Maria Thun’s “Biodynamic Sowing and Planting Calendar for North America 2015” and we are reading it from cover to cover. This is a necessity for biodynamic beekeeping as it has the calendar for working with the bees also. All of the students who take our course are given a copy of this calendar. We can highly recommend this calendar and this year it covers “ashing” to deal with mites and other hive problems. Besides helping us planning activities for the Spring around the Bees, it also helps us to work out our planting activities at the Glasshouse. We will be making a presentation about the World of the Honey Bee at the Upskilling Event taking place on April 9th in Annapolis County. Check out this event and the Local Prosperity Conference at http://www.localprosperity.ca Hope to meet some of you at that time. Please do introduce yourself to us. Building supers, repairing damaged supers , assembling Wooden Frames, scrubbing bottom boards,and making lists of supplies needed for the upcoming Spring season are all taking place in my woodworking shop since the beginning of the year. 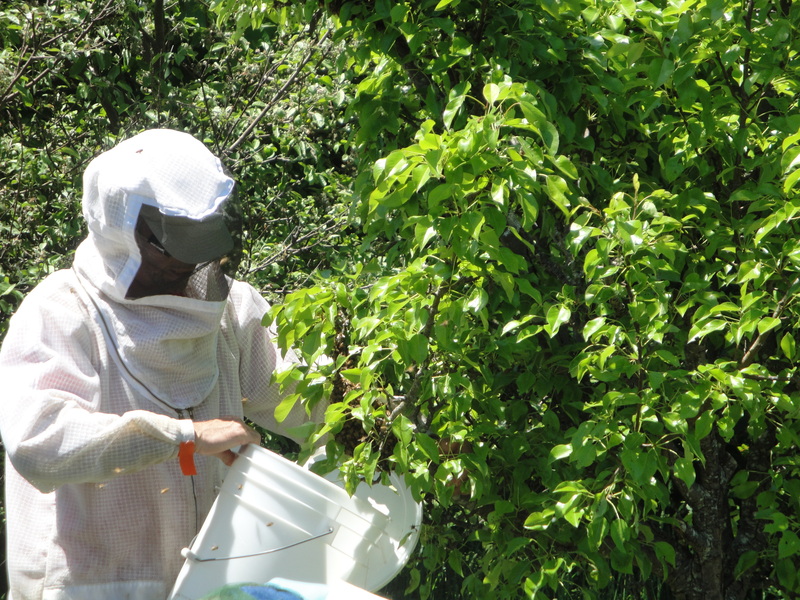 Being prepared is so important for the Keeper of Bees, because when the hives make their grand entrance back into the landscape things move very quickly. There are not enough hours in the day to keep up with the total Joyful Life Abundance Manifestation which takes place in late Spring and early Summer. Visiting the hives themselves next week is anticipated. robbing going on within the apiary, which makes the bees on edge too. before man intervened and decided that “bigger is better”– – well in some cases “more is less”. Xmas Market again this year. The Japanese Art Gallery in Barton, Digby Co., carries our honey on a regular basis. 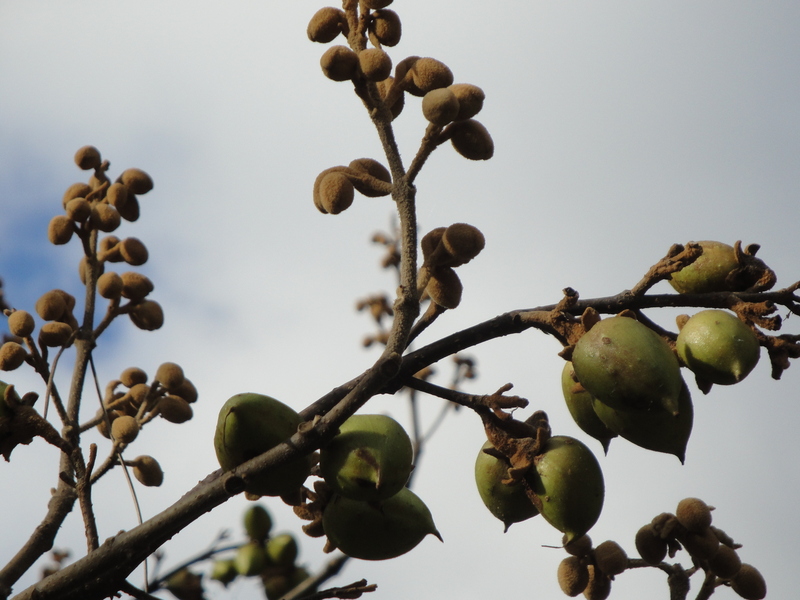 this late autumn feeding has lots of good natural health enhancers in it to help the bees immune system during the winter. Dissolve the sugar into the water with the grey salt over med/high heat until the sugar is completely dissolved into the liquid. The syrup must never bubble or boil, but must be hot enough to thoroughly integrate the crystals into the water. After removing from the heat you add the rest. You will know if it is done correctly when it cools and you have only a clear liquid and no crystals forming. that- be as being unfair business practices. We all have the Right to Know what we are feeding our families and ourselves -and no amount of profit making makes this less True. Our bees are healthy and full of Life and we wish this for everyone! where they will be added to our out apiary, the honey will be used to feed the hive for the winter and perhaps there may even be some extra to sell ! honey is special and some of the reasons why the honeybee is being killed. We also like the look on their faces when they sample the honey for the first time – tasting natural wildflower honey made by happy bees raised by biodynamic principles is a treat that we hope all of you have the opportunity to experience. is when the bees in the hive have decided it is time for the Queen Mum to leave home and set up a new hive elsewhere. something so moving in watching this rebirth happen – deep, mysterious and awesome. At the end this results in two hives. 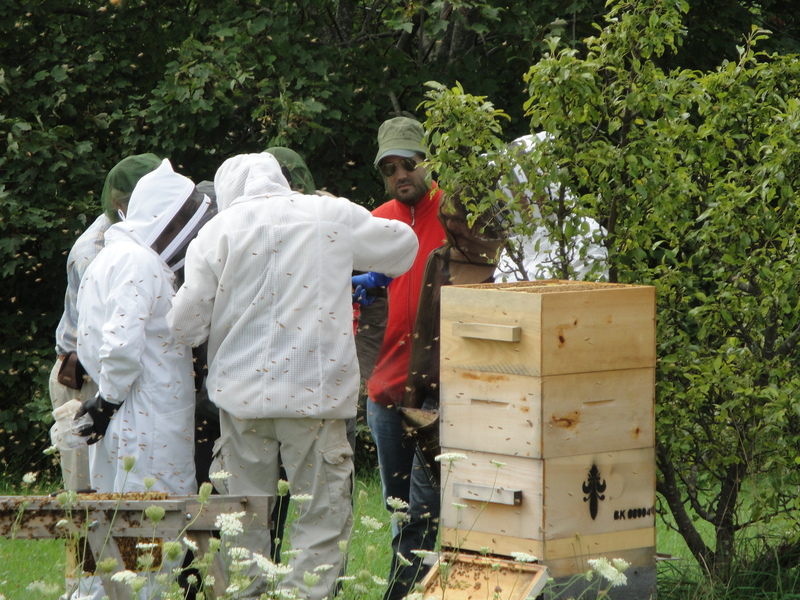 What happened at our workshop this past weekend was amazing in that, just as we were entering the apiary to do a hive inspection, we had a Swarming take place. The bees were very cooperative and just swarmed onto a small apple tree in the apiary. This is a picture of Klaus shaking the swarm into a bucket. We could not have planned such a wonderful event for the training – the participants had the opportunity to participate in the hiving of the swarm. successfully created is very weak beehives and very super strong pests and diseases. DSC05409 Klaus shaking the swarm into his “bee catcher” which is basically a plastic bucket with some additions made to it. and here at Bello Uccello apiary we will look forward to working with these new friends as keeper of bees ,as they establish their own apiaries. Here at Bello Uccello Apiary the bees are still flying around on those wonderful sunny days we are having, and at “the robber baron hive”, as we affectionately call our very strong Italian bee hive that loves to rob the other hives in the apiary, there were hundreds of new baby bees born this week and they were out doing their first orientation flights. We did an experiment on one of the hives and put blue styrofoam inside the cover to see if the bees liked the insulation. This method has been mentioned on many websites. The result was that the bees immediately started to gnaw the foam into tiny pieces and take the blue styrofoam out of their house and dump it on the ground. They do that with anything they don’t like in the hive. Interesting, that this “inert substance” which we humans all put in our homes for insulation and which is not supposed to affect our air quality, does not meet the building code standards of the bees here at Bello Uccello. So we learned one more thing from the bees about the “inert blue styrofoam” and helped the bees with the removal of it from the hive. We will never quite look at the blue foam without questioning what it is doing to our air and to us. All the hives now have wonderful biodynamic/organic oat straw insulating their lids. We purchased the straw from the biodynamic farm in Bear River – Bear River Farm.The surplus straw is going in the cold frames where we grow our winter greens and veggies here at Bello Uccello Estate. This is worth reading from the beginning to the end, if you wish to have information on what is happening to the honey which you are probably eating. Nothing in the article was news to us, other than the statistics on the sheer volume of this ultra filtered, corn syrup laden, “edible product” which is labeled as honey, which is out there. This ultra filtered honey does not have the pollen and the propolis and the enzymes which unpasteurized and gravity filtered honey has. We all eat honey because it is good for us and it tastes good too. But like the thousands of acres of “GMO inedible corn” which now grows in Idaho, so goes the millions of pounds of honey from China and India etc which has everything from heavy metals, illegal antibiotics,and perhaps even some corn syrup from that inedible corn. We call this particular phenomena which is happening on a global level: the Food Wars. Whether we know it or not, we are all involved in the Food Wars. Knowing the facts on what is involved to make pure wildflower honey allows you to ask the right questions before you purchase that jar of honey. Here is what we do to make one jar of honey:Stressless Conditions for the bees and their hive, as that is where they make the honey: 1. no antibiotics or any other chemicals are given to the bees 2. no chemicals, pesticides, herbicides mitecides are in the apiary or around the hives 3. no pollination services where the bees are moved to feed on mono cultured crops – the beehives stay in the apiary . 4. no plastics in hives Honey frames taken to honey house: 5. bees make the honey and we take the frames to the honey house directly from the hives and within a few hours we have extracted the frames. 6. the frames are spun around in a stainless steel drum and the honey is thrown out of the cells where it was made by the bees 7. the honey drops to the bottom of the drum where a tap is located to drain off the honey through a mesh net, which is like a jam making sieve, into a pail. The honey is not pumped or artificially pushed, it is gravity poured. 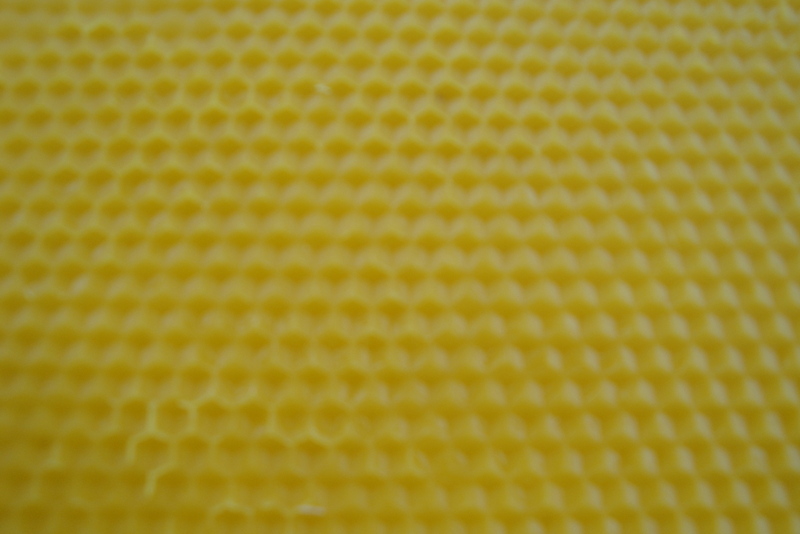 What stays behind in the net is small bee parts which you would not wish to find in your honey and some larger pieces of wax, but the bottled honey is full of pollen, propolis and even some wax. 8. when the pail is full we pour the honey into clean glass preserve jars and screw on the lids. Wildflower honey: bees fly in the wilds of nature and find nectar and pollen from natures diversity, as it comes into season. when you eat mono-crop honey, like lavender honey, apple blossom honey, blueberry honey,or any other mono-crop, you are eating honey from bees which have been exposed to many stressors in order to make that honey. How do I find good honey? After reading the website noted above and reading our notes on how natural, real wildflower honey is made, you are now prepared to ask the right questions. Visit the place where your honey comes from, buy local honey from your area, ask the beekeeper about his bees and his honey, buy organic honey if you can’t directly deal with a local, known supplier, and better still, buy biodynamic honey because they have the highest standards in the treatment of the honey bee. workshop to become part of a positive global response to this problem, were people originally from Newfoundland, Cornwall England, Glasgow Scotland, Manitoba, Bear River, Halifax and Austria . Just like the hive itself has babies, we had two absolutely adorable baby twins attending the entire workshop with their parents. The sincerity of the group was remarkable and after ploughing through the “natural science part ie the life cycle of the bee” they were game to put together the hive system which we have developed for the health of the bees and to investigate a live hive. After a day of no stings, lots of Sissiboo Coffee, homemade muffins and food, discussions, and more presentations by Klaus, we drove off to Digby Neck’s Lake Midway for a community potluck supper. Luckily we had lots of our Shaker Baked Beans to share and a veggie tray and we sat on our wool car blankets and had good conversations, met good people and this finished the day off “Nova Scotia style”. It was the God’s being kind to us that made the rain happen during the night so that the next day it was sunny and the lessons could take place in the apiary at Bello Uccello. The bees were very cooperative! The temperature in the bee suits is something to get used to and it was very hot in the apiary and in the honey house. Two hours past the time when the course was scheduled to conclude everyone swarmed back to the workshop facility for farewells and departures. The feedback of the workshop was very positive and with the help of these new friends and all the others around the globe who are embracing biodynamic principles and natural beekeeping and sustainable Life practices, we believe that mankind can transform the world. Was it Ghandi who said “change yourself and you change the world”. 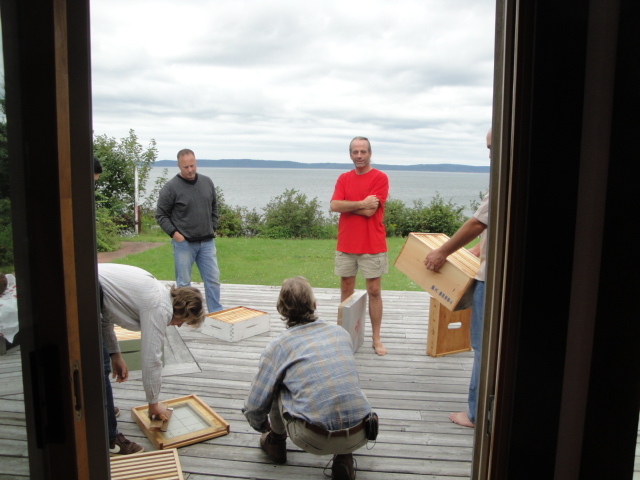 NOTICE: The last Natural Beekeeping Course for Beginners and for those who wish to change from chemical beekeeping to biodynamic beekeeping, for this year, will take place September 8th – 9th at Gilberts Cove, Nova Scotia. The cost of the course is $200.00 inclusive of meals and course materials. If you are thinking of becoming a keeper of bees in the Spring, this course would be helpful to you, as we teach about the bee, its needs, and a system which will help you to provide a healthy bee environment. Call 902-837-1030 to book.